A dental implant is a piece made of bio-compatible material that is screwed in the jawbone. Its role is to replace a root of a natural tooth. Once the dental implant is placed, it needs approximately 3 months to integrate into the jawbone. Than the metal cylinder called an abutment is attached to the implant and serves as a base for a dental crown, bridge or denture. The implant placement in Belgrade is performed by experienced implantologists, formed and certified by a most recognized dental implant production houses such as Straumann and Nobel Biocare. Our patients obtain a 10 years guarantee on placed implants as well as implant passport containing all necessary information which facilitates the follow-up at their country or by any dentist all over the world. Prior to the dental implant procedure it is necessary to evaluate the jawbone volume in order to determinate if it can support the implant and if so, which position is the most suitable for the implant placement and which implant dimension should be used. The jawbone volume is easy to evaluate by examination of patient’s panoramic X-ray or even better X-ray in 3D. If during the X-ray examination it is estimated that the jawbone volume isn’t sufficient to support a dental implant, a bone graft needs to be executed first. In Eurodentist this is of course well pointed out in your free quotation before your arrival. The dental implant placement is performed under local anesthesia and takes about half an hour. The implant is buried under the gum tissue and left for 3 to 6 month in order to integrate into the bone. During the waiting period the patient will get the provisional dentures if necessary. 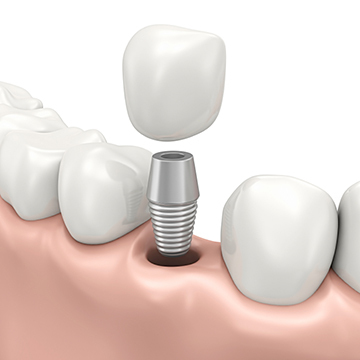 Once the implant is well integrated in jaw, an abutment is screwed in the implant and the crown is cemented. Sometimes it is possible to load the implant immediately. That means that the abutment is attached immediately after implant placement, the crowns are fixed and the gum heals at the same time as a bone build up. It is very important to note that in some cases, the general health of patient doesn’t allow the implant placement. Learn more about the contraindications.